The history of medical cannabis goes back to ancient times. Ancient physicians in many parts of the world mixed cannabis into medicines to treat pain and other ailments. In the 19th century, cannabis was introduced for therapeutic use in Western Medicine. Since then, there have been several advancements in how the drug is administered. Initially, cannabis was reduced to a powder and mixed with wine for administration. In the 1970's, synthetic THC was created to be administered as the drug Marinol in a capsule. However, the main mode of administration for cannabis is smoking because its effects are almost immediate when the smoke is inhaled. Between 1996 and 1999, eight U.S. states supported cannabis prescriptions opposing policies of the federal government. Most people who are prescribed marijuana for medical purposes use it to alleviate severe pain. "Dàmá", the Chinese word for "cannabis", compounds "big; great" and "cannabis; hemp." Cannabis, called má 麻 (meaning "hemp; cannabis; numbness") or dàmá 大麻 (with "big; great") in Chinese, was used in Taiwan for fiber starting about 10,000 years ago. The botanist Hui-lin Li wrote that in China, "The use of Cannabis in medicine was probably a very early development. Since ancient humans used hemp seed as food, it was quite natural for them to also discover the medicinal properties of the plant." The oldest Chinese pharmacopeia, the (c. 100 AD) Shennong Bencaojing 神農本草經 ("Shennong's Materia Medica Classic"), describes dama "cannabis". The flowers when they burst (when the pollen is scattered) are called 麻蕡 [mafen] or 麻勃 [mabo]. The best time for gathering is the seventh day of the seventh month. The seeds are gathered in the ninth month. The seeds which have entered the soil are injurious to man. It grows in [Taishan] (in [Shandong] ...). The flowers, the fruit (seed) and the leaves are officinal. The leaves and the fruit are said to be poisonous, but not the flowers and the kernels of the seeds. The early Chinese surgeon Hua Tuo (c. 140-208) is credited with being the first recorded person to use cannabis as an anesthetic. He reduced the plant to powder and mixed it with wine for administration prior to conducting surgery. The Chinese term for "anesthesia" (mázui 麻醉) literally means "cannabis intoxication". Elizabeth Wayland Barber says the Chinese evidence "proves a knowledge of the narcotic properties of Cannabis at least from the 1st millennium B.C." when ma was already used in a secondary meaning of "numbness; senseless." "Such a strong drug, however, suggests that the Chinese pharmacists had now obtained from far to the southwest not THC-bearing Cannabis sativa but Cannabis indica, so strong it knocks you out cold. The medical uses were highlighted in a pharmacopeia of the Tang, which prescribed the root of the plant to remove a blood clot, while the juice from the leaves could be ingested to combat tapeworm. The seeds of cannabis, reduced to powder and mixed with rice wine, were recommended in various other materia medica against several ailments, ranging from constipation to hair loss. The Ming dynasty Mingyi bielu provided detailed instructions about the harvesting of the heads of the cannabis sativa plant (mafen, mabo), while the few authors who acknowledged hemp in various pharmacopoeias seemed to agree that the resinous female flowering heads were the source of dreams and revelations. After copious consumption, according to the ancient Shennong bencaojing, one could see demons and walk like a madman, even becoming 'in touch with the spirits' over time. Other medical writers warned that ghosts could be seen after ingesting a potion based on raw seeds blended with calamus and podophyllum (guijiu). Every part of the hemp plant is used in medicine ... The flowers are recommended in the 120 different forms of (風 feng) disease, in menstrual disorders, and in wounds. The achenia, which are considered to be poisonous, stimulate the nervous system, and if used in excess, will produce hallucinations and staggering gait. They are prescribed in nervous disorders, especially those marked by local anaesthesia. The seeds ... are considered to be tonic, demulcent, alternative [restorative], laxative, emmenagogue, diuretic, anthelmintic, and corrective. ... They are prescribed internally in fluxes, post-partum difficulties, aconite poisoning, vermillion poisoning, constipation, and obstinate vomiting. Externally they are used for eruptions, ulcers, favus, wounds, and falling of the hair. The oil is used for falling hair, sulfur poisoning, and dryness of the throat. The leaves are considered to be poisonous, and the freshly expressed juice is used as an anthelmintic, in scorpion stings, to stop the hair from falling out and to prevent it from turning gray. ... The stalk, or its bark, is considered to be diuretic ... The juice of the root is ... thought to have a beneficial action in retained placenta and post-partum hemorrhage. An infusion of hemp ... is used as a demulcent drink for quenching thirst and relieving fluxes. In 2007, a late Neolithic grave attributed to the Beaker culture (found near Hattemerbroek [nl], Gelderland; dated 2459-2203 BCE) was found containing an unusually large concentration of pollen. After five years of careful investigation these pollen were concluded to be mostly cannabis along with a smaller amount of meadowsweet. Due to the fever-reducing properties of meadowsweet, the archeologists speculated that the person in the grave had likely been very ill, in which case the cannabis would have served as painkiller. The Ebers Papyrus (c. 1550 BC) from Ancient Egypt has a prescription for medical marijuana applied directly for inflammation. The Ebers Papyrus (c. 1550 BC) from Ancient Egypt describes medical cannabis. Other ancient Egyptian papyri that mention medical cannabis are the Ramesseum III Papyrus (1700 BC), the Berlin Papyrus (1300 BC) and the Chester Beatty Medical Papyrus VI (1300 BC). The ancient Egyptians used hemp (cannabis) in suppositories for relieving the pain of hemorrhoids. Around 2,000 BCE, the ancient Egyptians used cannabis to treat sore eyes. The egyptologist Lise Manniche notes the reference to "plant medical cannabis" in several Egyptian texts, one of which dates back to the eighteenth century BCE. Cannabis was a major component in religious practices in ancient India as well as in medicinal practices. For many centuries, most parts of life in ancient India incorporated cannabis of some form. Surviving texts from ancient India confirm that cannabis' psychoactive properties were recognized, and doctors used it for treating a variety of illnesses and ailments. These included insomnia, headaches, a whole host of gastrointestinal disorders, and pain: cannabis was frequently used to relieve the pain of childbirth. One Indian philosopher expressed his views on the nature and uses of bhang (a form of cannabis), which combined religious thought with medical practices. "A guardian lives in the bhang leaf. …To see in a dream the leaves, plant, or water of bhang is lucky. …A longing for bhang foretells happiness. It cures dysentry and sunstroke, clears phlegm, quickens digestion, sharpens appetite, makes the tongue of the lisper plain, freshens the intellect and gives alertness to the body and gaiety to the mind. Such are the useful and needful ends for which in His goodness the Almighty made bhang." The Ancient Greeks used cannabis not only for human medicine, but also in veterinary medicine to dress wounds and sores on their horses. The Ancient Greeks used cannabis to dress wounds and sores on their horses. In humans, dried leaves of cannabis were used to treat nose bleeds, and cannabis seeds were used to expel tapeworms. The most frequently described use of cannabis in humans was to steep green seeds of cannabis in either water or wine, later taking the seeds out and using the warm extract to treat inflammation and pain resulting from obstruction of the ear. In the 5th century BC Herodotus, a Greek historian, described how the Scythians of the Middle East used cannabis in steam baths. These baths drove the people to a frenzied state. An advertisement for Maltos-Cannabis, a Scandinavian cannabis-based drink popular in the early 20th century. In the mid 19th century, medical interest in the use of cannabis began to grow in the West. In the 19th century cannabis was one of the secret ingredients in several so called patent medicines. There were at least 2000 cannabis medicines prior to 1937, produced by over 280 manufacturers. The advent of the syringe and injectable medicines contributed to an eventual decline in the popularity of cannabis for therapeutic uses, as did the invention of new drugs such as aspirin. An Irish physician, William Brooke O'Shaughnessy, is credited with introducing the therapeutic use of cannabis to Western medicine. He was Assistant-Surgeon and Professor of Chemistry at the Medical College of Calcutta, and conducted a cannabis experiment in the 1830s, first testing his preparations on animals, then administering them to patients to help treat muscle spasms, stomach cramps or general pain. Modern medical and scientific inquiry began with doctors like O'Shaughnessy and Moreau de Tours, who used it to treat melancholia and migraines, and as a sleeping aid, analgesic and anticonvulsant. At the local level authorities introduced various laws that required the mixtures that contained cannabis, that was not sold on prescription, must be marked with warning labels under the so-called poison laws. In 1905 Samuel Hopkins Adams published an exposé entitled "The Great American Fraud" in Collier's Weekly about the patent medicines that led to the passage of the first Pure Food and Drug Act in 1906. This statute did not ban the alcohol, narcotics, and stimulants in the medicines; rather, it required medicinal products to be labeled as such and curbed some of the more misleading, overstated, or fraudulent claims that previously appeared on labels. At the turn of the 20th century the Scandinavian maltose- and cannabis-based drink Maltos-Cannabis was widely available in Denmark and Norway. Promoted as "an excellent lunch drink, especially for children and young people", the product had won a prize at the Exposition Internationale d'Anvers in 1894. A Swedish encyclopedia from 1912 claim that European hemp, the raw material for Maltos-Sugar, almost lacked the narcotic effect that is typical for Indian hemp and that products from Indian hemp was abandon by modern science for medical use. Maltos-Cannabis was promoted with text about its content of maltose sugar. Later in the century, researchers investigating methods of detecting cannabis intoxication discovered that smoking the drug reduced intraocular pressure. [unreliable source?] In 1955 the antibacterial effects were described at the Palacký University of Olomouc. Since 1971 Lumír Ondřej Hanuš was growing cannabis for his scientific research on two large fields in authority of the University. The marijuana extracts were then used at the University hospital as a cure for aphthae and haze. In 1973 physician Tod H. Mikuriya reignited the debate concerning cannabis as medicine when he published "Marijuana Medical Papers". High intraocular pressure causes blindness in glaucoma patients, so he hypothesized that using the drug could prevent blindness in patients. Many Vietnam War veterans also found that the drug prevented muscle spasms caused by spinal injuries suffered in battle. In 1964, Dr. Albert Lockhart and Manley West began studying the health effects of traditional cannabis use in Jamaican communities. They discovered that Rastafarians had unusually low glaucoma rates and local fishermen were washing their eyes with cannabis extract in the belief that it would improve their sight. Lockhart and West developed, and in 1987 gained permission to market, the pharmaceutical Canasol: one of the first cannabis extracts. They continued to work with cannabis, developing more pharmaceuticals and eventually receiving the Jamaican Order of Merit for their work. Later, in the 1970s, a synthetic version of THC was produced and approved for use in the United States as the drug Marinol. It was delivered as a capsule, to be swallowed. Patients complained that the violent nausea associated with chemotherapy made swallowing capsules difficult. Further, along with ingested cannabis, capsules are harder to dose-titrate accurately than smoked cannabis because their onset of action is so much slower. Smoking has remained the route of choice for many patients because its onset of action provides almost immediate relief from symptoms and because that fast onset greatly simplifies titration. For these reasons, and because of the difficulties arising from the way cannabinoids are metabolized after being ingested, oral dosing is probably the least satisfactory route for cannabis administration. Voters in eight U.S. states showed their support for cannabis prescriptions or recommendations given by physicians between 1996 and 1999,[needs update] including Alaska, Arizona, California, Colorado, Maine, Michigan, Nevada, Oregon, and Washington, going against policies of the federal government. In May 2001, "The Chronic Cannabis Use in the Compassionate Investigational New Drug Program: An Examination of Benefits and Adverse Effects of Legal Clinical Cannabis" (Russo, Mathre, Byrne et al.) was completed. This three-day examination of major body functions of four of the five living US federal cannabis patients found "mild pulmonary changes" in two patients. Among the more than 108,000 persons in Colorado who in 2012 had received a certificate to use marijuana for medical purposes, 94% said that severe pain was the reason for the requested certificate, followed by 3% for cancer and 1% for HIV/Aids. The typical card holder was a 41-year-old male. Twelve doctors had issued 50% of the certificates. Opponents of the card system claim that most card holders are drug abusers who are faking or exaggerating their illnesses; three-fourths male patients is not the normal pattern for pain patients, it is the normal pattern for drug addicts, claim the critics. After the implementation of medical cannabis in Colorado has also the past 30-day use of marijuana by teens increased significant compared with the average in the U.S. (Prescription to teens is not allowed in Colorado). ^ Li, Hui-Lin (1974). "An Archaeological and Historical Account of Cannabis in China", Economic Botany 28.4:437–448, p. 444. ^ Bretschneider, Emil (1895). Botanicon Sinicum: Notes on Chinese Botany from Native and Western Sources. Part III, Botanical Investigations in the Materia Medica of the Ancient Chinese. Kelly & Walsh. p. 378. ^ de Crespigny, Rafe (2007). A Biographical Dictionary of Later Han to the Three Kingdoms (23–220 AD). Leiden: Brill Publishers. p. 332. ISBN 978-90-04-15605-0. OCLC 71779118. ^ Barber, Elizabeth Wayland. (1992). Prehistoric Textiles: The Development of Cloth in the Neolithic and Bronze Ages with Special Reference to the Aegean. Princeton University Press. p. 38. ^ Dikötter, Frank, Lars Laamann, and Zhou Xun (2004), Narcotic Culture: A History of Drugs in China, University Of Chicago Press, p. 200. ^ Wong, Ming (1976). La Médecine chinoise par les plantes. Paris: Tchou. p. 142. OCLC 2646789. ^ Smith, Frederick Porter (1911). Chinese Materia Medica: Vegetable Kingdom. Shanghai: American Presbyterian Mission Press. pp. 90–91. ^ "The Ebers Papyrus The Oldest (confirmed) Written Prescriptions For Medical Marihuana era 1,550 BC". onlinepot.org. Retrieved 2008-06-10. ^ "History of Cannabis". reefermadnessmuseum.org. Archived from the original on 25 May 2008. Retrieved 2008-07-09. ^ Pain, Stephanie (15 December 2007). "The Pharaoh's pharmacists". New Scientist. Reed Business Information Ltd.
^ a b Bloomquist, Edward (1971). Marijuana: The Second Trip. California: Glencoe Press. ^ Touw, Mia (1981). "The Religious and Medicinal Uses of Cannabis in China, India and Tibet". Journal of Psychoactive Drugs. 13 (1): 23–34. doi:10.1080/02791072.1981.10471447. PMID 7024492. ^ a b c d e Butrica, James L. (2002). "The Medical Use of Cannabis Among the Greeks and Romans". Journal of Cannabis Therapeutics. 2 (2): 51. doi:10.1300/J175v02n02_04. ^ Lozano, Indalecio (2001). 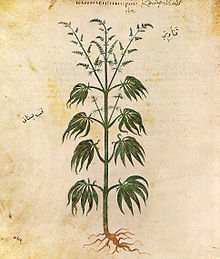 "The Therapeutic Use of Cannabis sativa (L.) in Arabic Medicine". Journal of Cannabis Therapeutics. 1: 63. CiteSeerX 10.1.1.550.1717. doi:10.1300/J175v01n01_05. ^ a b c Tom Decorte; Gary W. Potter; Martin Bouchard (2011). World Wide Weed: Global Trends in Cannabis Cultivation and Its Control. Ashgate Publishing, Ltd. p. 59. ISBN 978-1-4094-1780-4. ^ a b "History of Cannabis". BBC News. 2 November 2001. Retrieved 17 August 2011. ^ The Antique Cannabis Book. antiquecannabisbook.com (16 March 2012). Retrieved 2012-05-19. ^ "The Newsweekly for Pharmacy". Chemist + Druggist. London, New York City, Melbourne: Benn Brothers. 28: 68, 330. 1886. ^ Adams, Samuel Hopkins (1905). The Great American Fraud (4th ed., 1907). Chicago: American Medical Association. Retrieved 2009-07-30. ^ "Hurudan är Extract af Maltos". Kalmar (in Swedish). 1894-07-08. p. 4. ^ "Hasjisj, Nordisk familjebok, 1912". Runeberg.org. 2016-01-17. Retrieved 2018-02-12. ^ "Nad léčivými jointy s Lumírem Hanušem" (in Czech). blisty.cz. Retrieved 2011-05-03. ^ Baker D, Pryce G, Giovannoni G, Thompson AJ (May 2003). "The therapeutic potential of cannabis". Lancet Neurol. 2 (5): 291–8. doi:10.1016/S1474-4422(03)00381-8. PMID 12849183. ^ Russo, Ethan; Mathre, Mary Lynn; Byrne, Al; Velin, Robert; Bach, Paul J.; Sanchez-Ramos, Juan; Kirlin, Kristin A. (2002). "Chronic Cannabis Use in the Compassionate Investigational New Drug Program". Journal of Cannabis Therapeutics. 2: 3. doi:10.1300/J175v02n01_02. ^ Opinion, Guest. "Ed Gogek: The untold story behind medical marijuana's success, ARIZONA CAPITOL TIMES, May 24, 2013". Azcapitoltimes.com. Retrieved 2018-02-12. ^ Polk, Sheila (2014-01-06). "Sheila Polk: Legalized marijuana: Colorado kids are paying the price, 2014 azcentral.com, Mon Jan 6, 2014". Azcentral.com. Retrieved 2018-02-12. Zuardi, Antonio Waldo (2006). "History of cannabis as a medicine: A review". Revista Brasileira de Psiquiatria. 28 (2): 153–7. doi:10.1590/S1516-44462006000200015. PMID 16810401. This page was last edited on 21 April 2019, at 03:57 (UTC).